Shop for authentic replica Grand Union flags. Our Grand Union flags are constructed of durable nylon with a canvas heading and offered in five sizes. 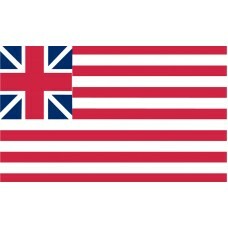 The Grand Union Flag is generally recognized as being the United States of America's first national flag. It was first hoisted by John Paul Jones, considered by many the Father of the American Navy, in 1775. 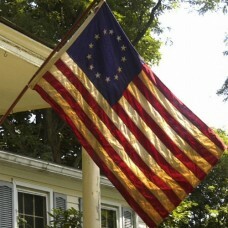 The flag has the now familiar pattern of 13 horizontal red and white stripes representing the Revolutionary colonies. Its canton is the flag of the United Kingdom at that time. As the Union's first national emblem, the Grand Union Flag is known by many other names. These include the Cambridge or Congress Flag, the Continental Colors, and the First Navy Ensign. As the emerging US civilian and military forces grew simultaneously, so the flag was flown on ships and outside buildings. It quickly gained enormous popularity, and flag makers were in high demand. The British had a national flag, and two ensigns for their two naval fleets. The ensign of any vessel is hoisted at its rear, or stern, to identify its country of origin. The British Royal Navy had a white ensign, while its Merchant Navy flew a red one. The Grand Union Flag could be created by sewing white stripes across a Merchant Navy red ensign. This kind of practical creativity was typical of the ingenuity of the Revolutionary Americans. The Grand Union Flag was unique because it united civilian, military and naval forces under the same banner. This gave the new country a sense of solidarity which helped it prevail against a seemingly much larger, world power. There were earlier flags flown by some states, such as the Taunton and George Rex flags in Massachusetts and New York, but the Grand Union soon gained widespread acceptance. In 1775, when the flag was first flown, the Second Continental Congress had assumed day to day government of the United States. As the country was at war, the Congress organized the creation of its army, navy and marine forces. At first, the new nation was called the United Colonies, and the Congress wanted a national flag which would represent this. The Grand Union Flag, first hoisted by Jones on his ship the Alfred in Philadelphia on December 3rd 1775, was flown for the first time on land four weeks later. It is believed that George Washington himself used it on New Year's Day 1776, at Prospect Hill in Boston. Signaling a new year and a new era, the flag was flown as a clear message to the British that a new country had been born. There are sources which assert that the very first Grand Union Flag was made by Margaret Manny, a Philadelphia milliner. As this city was the early capital of the newly independent nation, it was home to a large number of craftspeople who turned their hands to making flags. Whether or not Margaret was its first maker, the Grand Union Flag was a huge success.